Silver lining for one VA GOPer "If Obamacare can close a gap like that for Cuccinelli, think about what it will do to Senate Dems next year"
And with new votes in from VA suburbs, @TerryMcAuliffe takes the lead, with 91% of votes. gotta wonder: would all that GOP money that stayed on the sidelines have made a difference? Virginia vote update (9:38pm): McAuliffe 909,.583 (47%0. Cuccinelli 904,603 (46%), 4,980 vote margin. also re: money, Bob McDonnell being sidelined a huge blow for Cooch. had enormous cred with GOP donors who sat on their wallets. Christie opponent Buono praises her team who "withstood the onslaught of betrayal from our own political party." Chris Christie tells CNN that he's a "conservative." Rand Paul labels him a "moderate." 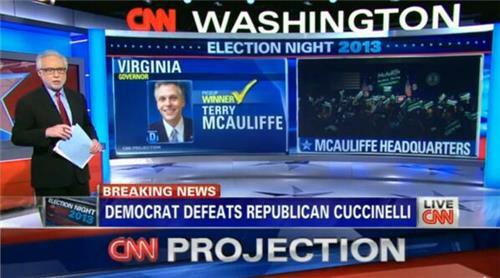 BREAKING NEWS CNN Projects that Terry McAuliffe wins Virginia Governor's race. Breaking: @wolfblitzer projects @TerryMcAuliffe the next governor of Virginia. worth nothing: RGA went off TV in Virginia several weeks ago + RNC committed far less than in 2009 race, when they spent $9 mil. With election returns and projections rolling in, be sure to stay with #CNN as we air a live #Crossfire at 11:30pET breaking it all down. Trenton makes, the world takes? “Tonight I stand here as your governor and I am so proud to be your governor." @GovChristie speech live now on CNN.